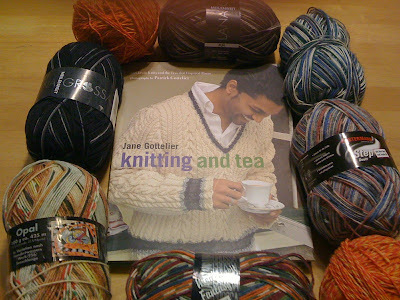 What I did on Sunday when I should have been resting in bed some more, was go to the Stitches West knitting convention. Yes, you read that right, knitting convention. More wool, silk, fiber, color under one roof than you can shake a stick at! (I guess I should say, shake 2 pointed sticks at...heh heh) Here is a link to the organizer's site, but they have already updated to the next convention in Georgia. Being in budget mode, I was scavenging extra chores on Saturday, trying to supplement the meager remains from my weekly allowance to find money to spend on yarn and books. I deposited some rebate checks that I've been carrying around in my wallet, took all my recyclables in, and "borrowed" some money from next week's allowance. I even packed my lunch to stretch my money further. DH won major points by contributing from his weekly allotment as well. He said he might as well fund the yarn purchases, since I am knitting socks for the whole family and am in the midst of making him his requested mittens. 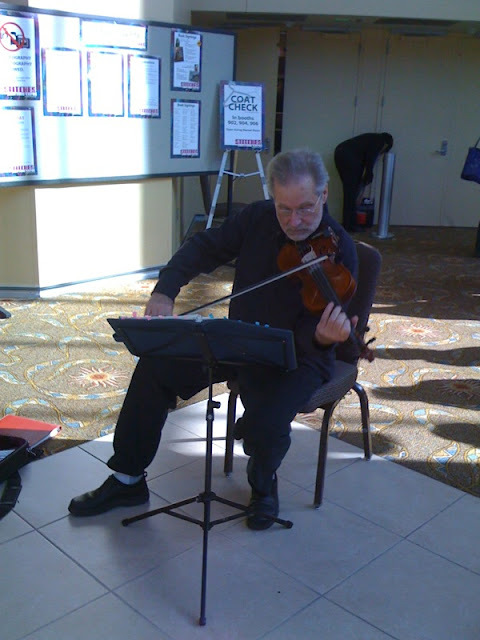 Sunday morning at 9:55am, while lined up with friends, waiting to get in, I was so excited, I could hear violin music playing in the background. No wait, there really IS a violinist here, serenading us! Very nice touch from the event planners. And stuff piled in his open case, clearly discouraging the throwing in of loose change. I felt flush with cash on my little spree, and came home with enough sock yarn to keep me busy until Stitches next year. I did stop and fondle some lovely hand-dyed mohair yarn, but mostly looked for the bargain bins of wool where I could find it. I wantonly checked out the Ashford and the Cricket tabletop looms...my next hobby calls. I also found a V-neck aran sweater pattern--rare prey indeed. I could use a nice pair of socks, too, you know. Hmm, not bad...4 of the skeins in this picture have turned into socks already! Yay me!